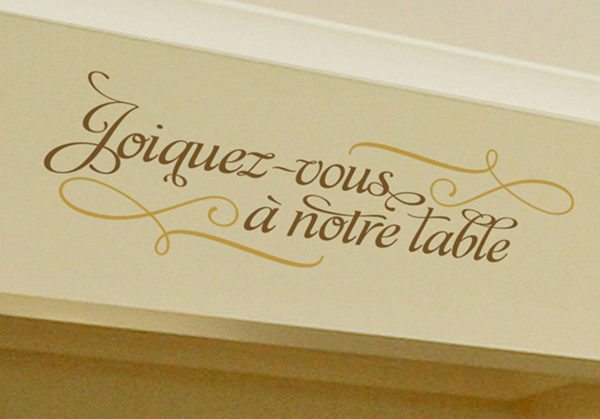 Are you looking for lettering to decorate your dining room? Are you looking for the appropriate French words that space? Look no further! 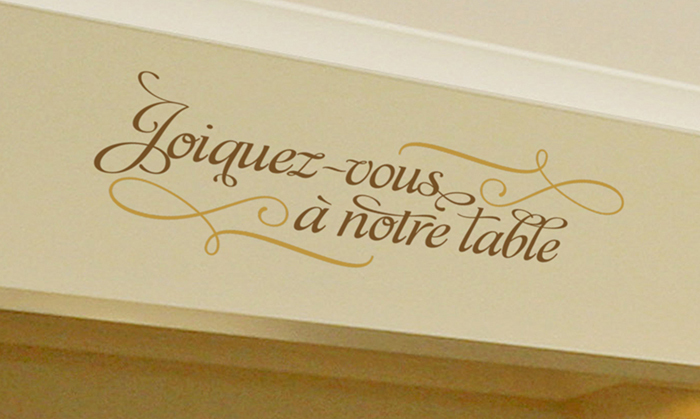 At Decorative Lettering we have wall words, in French, which are suitable for all the spaces in your home and office. 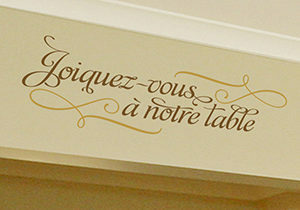 ‘Joiquez-vous a notre table’ lettering is perfect for the dining room. It is an invitation to your friends and family to your table for a sumptuous meal with great company! 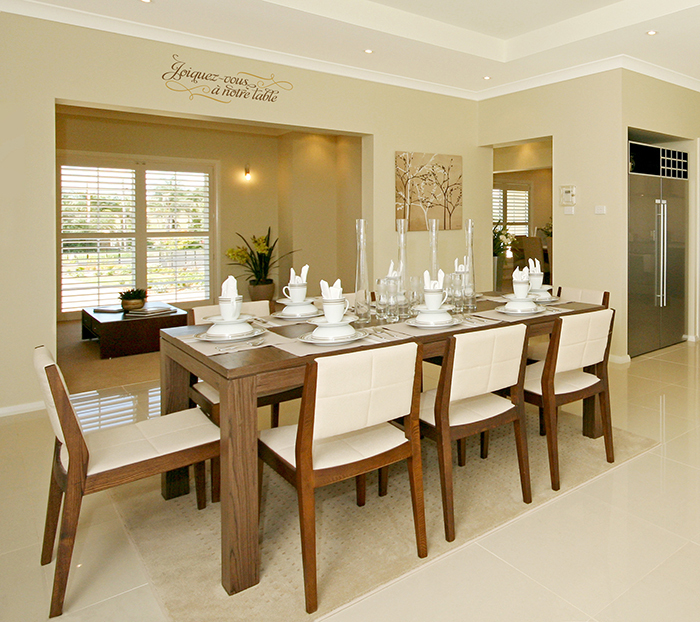 Our dining table faces the family room with a grand outdoors view. A flat arch connects the two spaces and our lettering was applied above it. It is visible to all at the dining table. 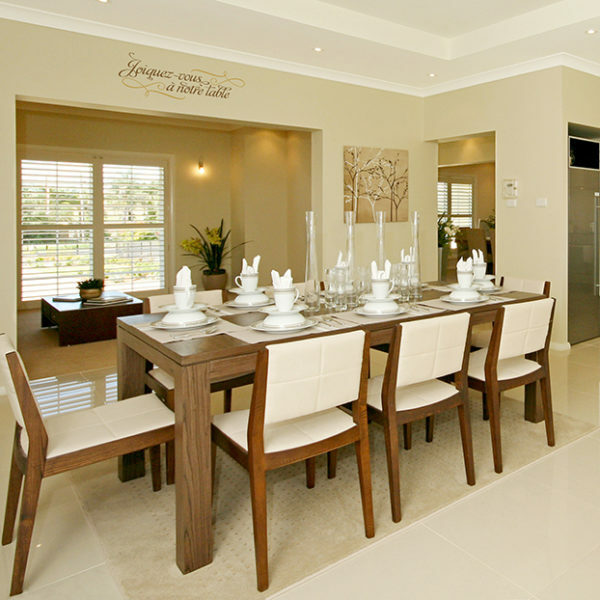 The view, the warm message on the wall, and great company are bound to make meal times in this elegant setting, a memorable one! The cinnamon colored wall quotes tie into the dining table while the decorative ends complement the harvest gold color theme in both rooms. This is a practical yet creative way to make sure that there is continuity in design theme! Our lettering is durable. Resin made, it does not fade or crack! Application is easy. The lettering is pre-cut and pre-spaced and placed on a sheet of paper. To apply, simply peel the sheet and stick the adhesive side of the lettering on to the wall! We have many more quotes, so do check out our ‘By Language’ category. If we do not have your preferred quote, submit it. We will design your wall decals in your choice of quote and language! Our products are affordable and we also have a customer awards program for earning redeemable points on every purchase. Sign up! We deliver on time and our designers make sure it is a quality product. Get in touch and let us help you decorate your wall space with wall lettering in your favorite language!